The Giants held their annual media open house Wednesday, unveiling some upgrades to the ballpark and highlighting promotions and special events slated for the upcoming season. Of course, the big attractions as usual were the food offerings, as AT&T Park continues to find new ways of expanding fans’ waistlines in all sorts of delicious manners. First, in non-food-related news, perhaps the most visible change to the ballpark will be out next to the Coca-Cola Fan Lot (where the Coke bottle, incidentally, will have a fresh paint job in honor of a seven-year extension of the soda company’s partnership with the Giants). Gone is the Build-A-Bear Workshop and in its place will be a new social media center, which “will display social chatter of Giants fans in real time including tweets, photos from Instagram and polls from Facebook, all in real time.” The center, which will be named during its grand opening, will also feature a Peet’s Coffee Bar. 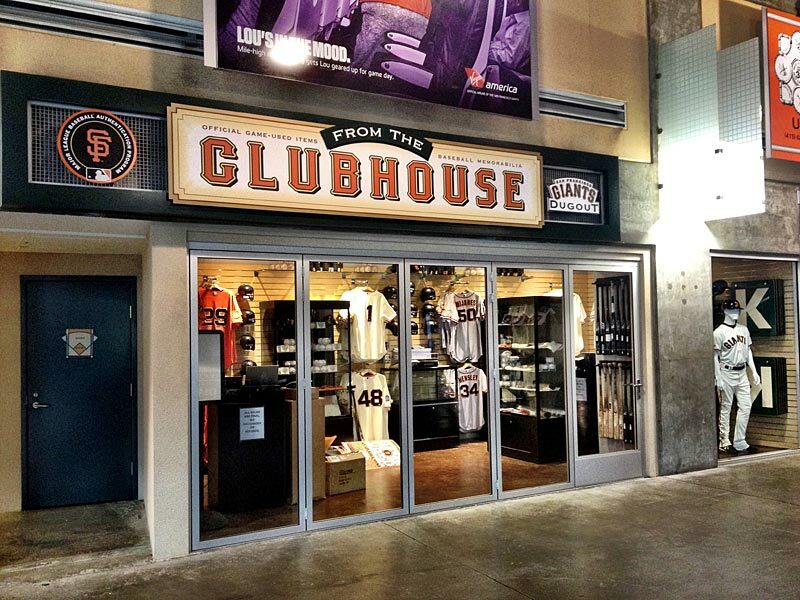 Also notable on the Promenade level: The From the Clubhouse shop, where fans can buy authenticated and game-used items, has been relocated and expanded to a spot right where fans enter the concourse off the ramp inside Willie Mays Gate. 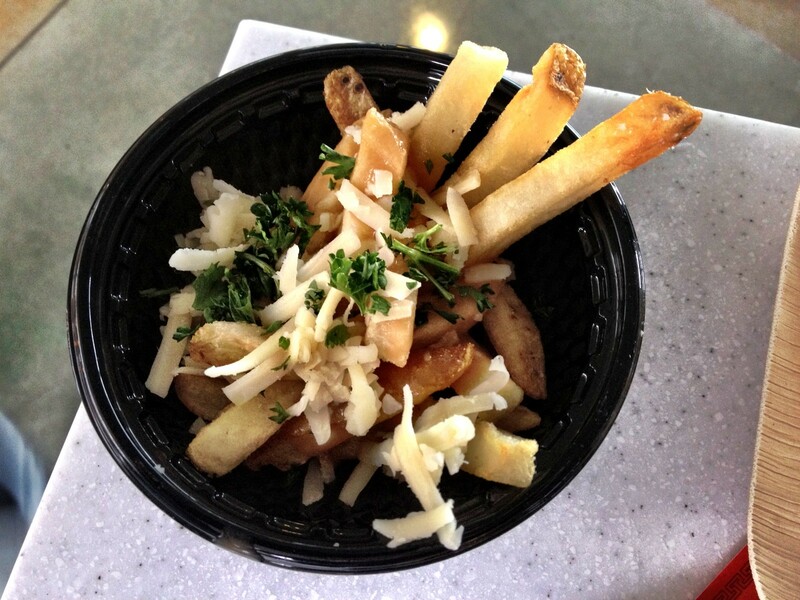 Nearby is a newly expanded ticket office and a large new walk-in Guest Services center, next to the Gilroy Garlic Fries stand. 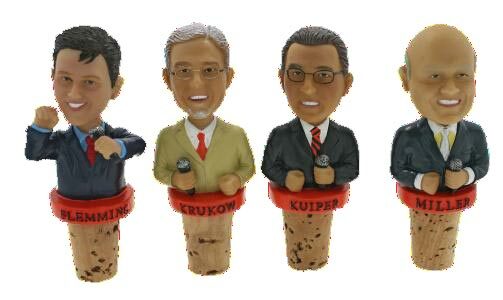 The Giants will continue to lead the Majors in cool giveaways, which are listed here and include many World Series champions items, three bobbleheads, two gnomes and Giants announcers bottle stoppers. The special events calendar also is packed, with highlights including Metallica Night, Elvis Presley Night and Until There’s a Cure Day featuring a Rod Beck bobblehead. 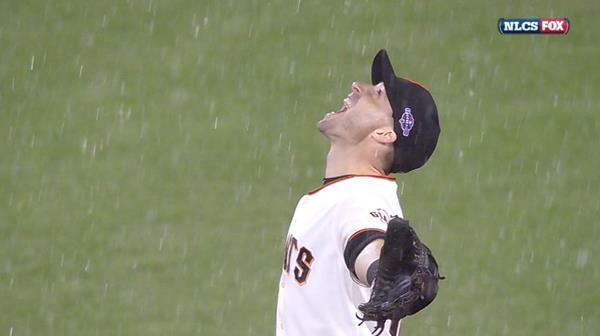 A personal favorite: On Social Media Night (July 26), the Giants will recognize an idea posted to the McCovey Chronicles blog and give away a Marco Scutaro rain globe, in tribute to Scutaro’s legendary pose in the rain during the NLCS-clinching game. Both the fan who posted the idea to McC and the blogger who runs it will be included in the night’s events. Remember that all special events require a special ticket in order to receive the giveaway item and participate in pregame parties. Lots of sponsorship news, including Coca-Cola partnering with the Giants for a “Salute to the Military” program and Mumm Napa releasing two new Giants-branded sparkling wines. Fans will also be happy to hear the ballpark will have more than double the number of WiFi access points this season, as well as the addition of more than 400 mobile charging points. 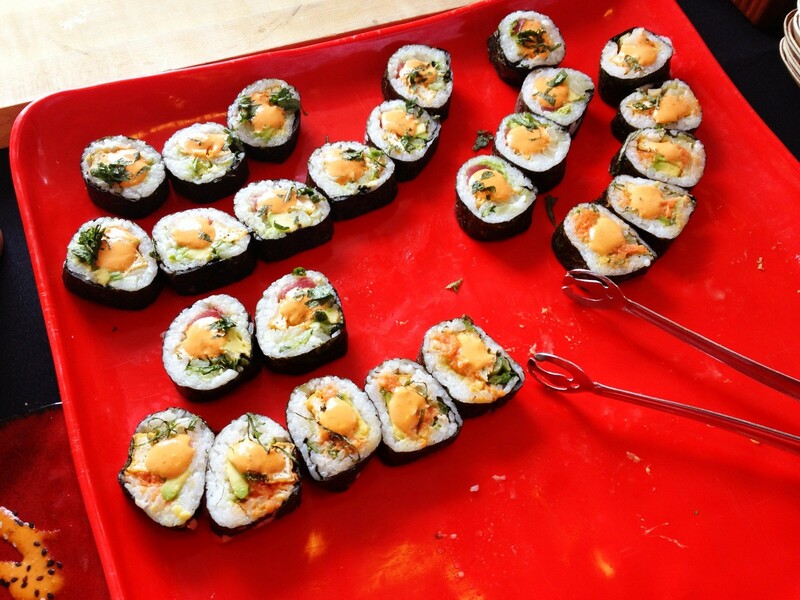 But let’s get to what draws the most attention: the ballpark food. Pop-up bistros will appear at AT&T Park, and they’ll only be advertised on the @sfgiantfoodie Twitter feed, a la food trucks. The list of new and featured stands, kiosks, carts and offerings is long, so I’ll paste it in directly at the bottom, after a selection of photos from the media open house. Keep in mind that the portion sizes shown here are much smaller than normal, since we’re sampling a wide range of offerings. SF Giant roll from Mashi’s Sushi. Lamb burger from Murph’s Pub, Idaho Russet potatoes and buttery mashed potatoes from the Emerald Isle Potato Bar. 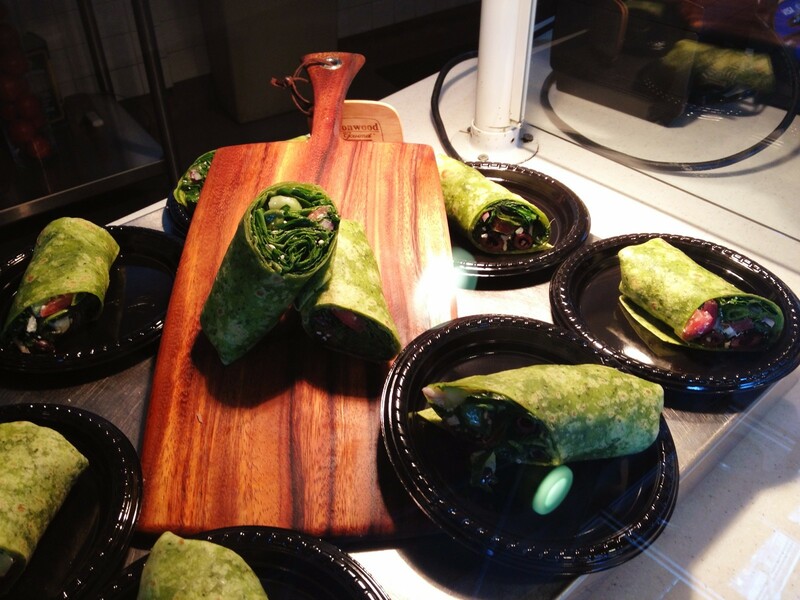 Giuseppe Bazurro’s popular Greek salad and chicken Caesar are now available as wraps. Vintage 58: A new wine bar with an exclusive location behind home plate on the Promenade Level featuring tasting room décor and offering selected varietals from various regions. McCovey’s BBQ Restaurant Kiosk: A new location for McCovey’s tasty BBQ at the top of O’Doul’s Gate featuring pulled pork nachos. Say Hey Sausage Kiosk: A new portable kiosk on the Promenade Level featuring a variety of specialty sausages including Atomic Hot & Half Pound Polish kielbasa sausage and Bavarian Pretzels. Chicago Dog Cart: Located directly behind home plate on the Promenade Level featuring the Original Chicago Dog with all the authentic toppings. Lefty O’Doul’s Bar: Another San Francisco icon joins the team at AT&T Park. This satellite location of the historic Lefty O’Doul’s bar located at Union Square, features their famous Bloody Mary mix, specialty cocktails and is located at the top of the O’Doul Gate. 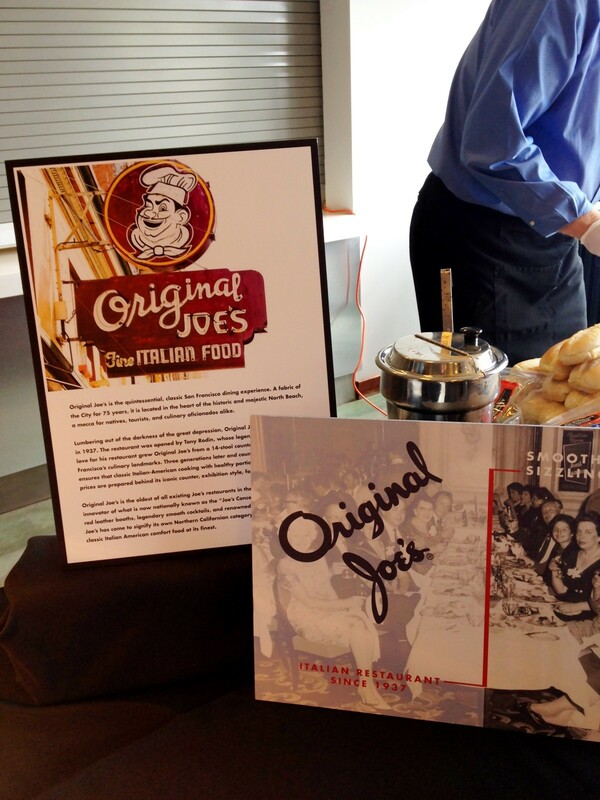 Original Joe’s Burger: The Derby Grill Specialty Burger Stand located on the Promenade Level in Left Field, will feature the exact recipe of the iconic Original Joe’s burger. Other new Items found throughout the ballpark: Pannini sandwiches, Poutine Fries — French fries smothered with beef gravy & white cheddar; Mumm’s Sparkling Wine; Carmel topped Ghirardelli hot cocoa; and field roast artesian vegetarian sausages. Pop Ups: Playing on the popularity of mobile food carts, pop-up bistros will be advertised only via the @sfgiantfoodie Twitter feed. #GiantPopUp will feature treats not currently available at the ballpark, including made-to-order hot pastrami sandwiches and knish, oysters on the half shell, hot apple cider and warm turnovers filled with Frog Hollow Farms fruit preserves. Ferry Terminal Seafood: In partnership with Ferry Terminal Seafood, the new Club Level seafood cart located near the Carvery and Section 234 will offer up such favorites as New England and Manhattan clam chowder, shrimp and crab Louis, seafood cocktails, and freshly baked sourdough bread. Still and sparkling wine by the glass. 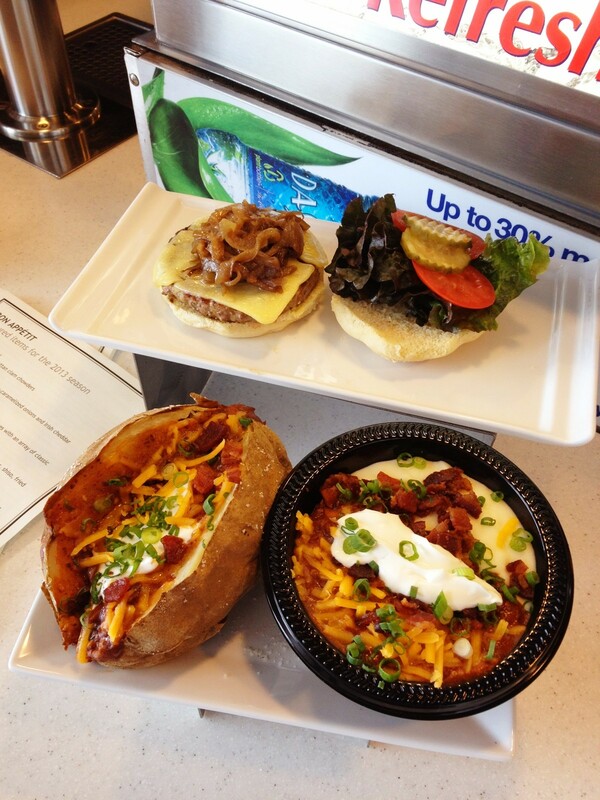 Emerald Isle Potato Bar: A baked potato concept located next to Murph’s Pub on the Club Level. Like Long Taters, Emerald Isle will feature extra-large baked Idaho potatoes and buttery mashed potatoes with an array of classic toppings. Farmer’s Market: A brand-new look for the Farmer’s Market, located on the Club Level. The mercantile offers locally grown produce, fresh fruit aguas frescas, strawberry shortcake, seasonal pies and gelato. Indulge a savory appetite with seasonal vegetable antipasti and a wine bar specializing in sustainable and locally crafted wines both on tap and from the bottle. Joe Garcia’s: New items available at Joe Garcia’s include: Crisp griddled gorditas topped with a house pickled cabbage and jalapeno slaw; Chipotle Sweet Potato Fries; and a Burrito Bowl featuring char grilled chicken, ancho chile rubbed skirt steak, carnitas or chile lime marinated white fish served with Spanish rice and topped with classic burrito fillings. Guiseppi Barzurro’s: New items available at Guiseppi Barzurro’s include the favorite Greek and chicken Caesar salads available in wraps and a Grilled Eggplant Sandwich featuring balsamic, thyme and garlic marinated eggplant grilled and topped with roasted red bell peppers, goat cheese, salsa verde and baby arugula on a baguettini. Mashi’s Sushi: New items available at Mashi’s Sushi include SF “Giant” Roll-ahi tuna, avocado, bok choy, shiso, green onion, fried tofu and scichimi aioli create one giant roll; Sashimi Bowls with ahi tuna or arctic char garnished with shiso and mayo with a choice of brown or white rice; and Tofu and Bok Choy in a lemon-grass green curry topped with ice peppers served over brown or white rice. Murph’s Pub: The Irish Lamburger served with Guinness caramelized onions and Irish Cheddar will be a new item on the popular menu. Krukow may remind fans to bring their gloves, but it’s fair to say they should also bring their appetites. 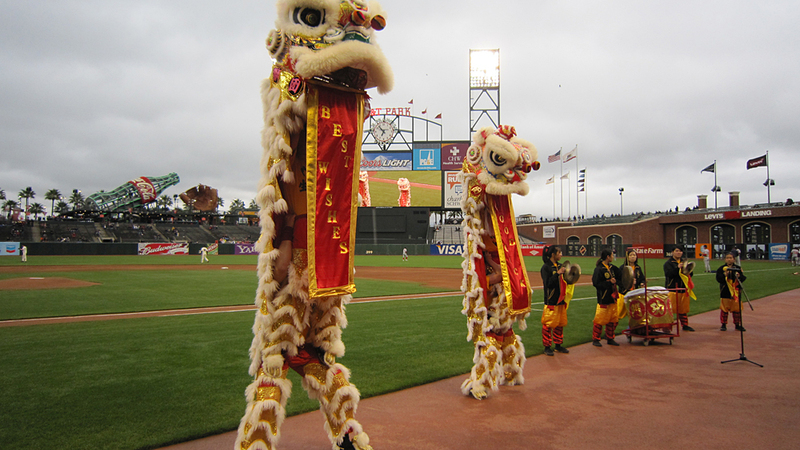 Tuesday was not only the start of a nine-game homestand for the Giants at AT&T Park, it was Chinese Heritage Night, one of many special events slated for the ballpark during the season. Those with special pre-purchased tickets, proceeds of which will benefit local Chinese charities, received a Giants-themed “Year of the Tiger” figurine. Pregame entertainment featured the always-amazing lion dancers, a video of which is embedded below. Check out Lou Seal having some fun with his new friend partway through the video. A special note about Monday’s Memorial Day game: Not only is it a day game, but Tim Lincecum is scheduled to make his 100th Major League start against Rockies ace (and no-hitter owner) Ubaldo Jimenez. 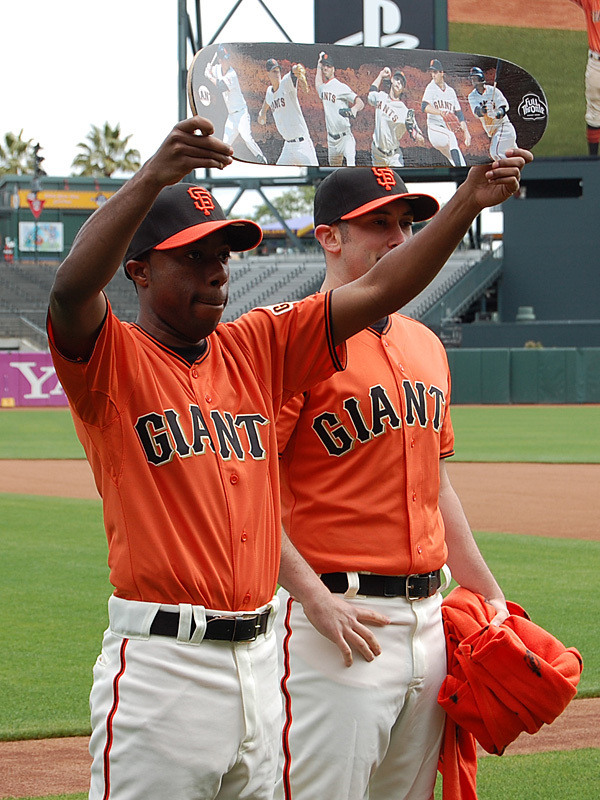 Best of all, that game is a Giants Dynamic Deal of the Week, with View Level tickets available for just $7. See you at the yard! 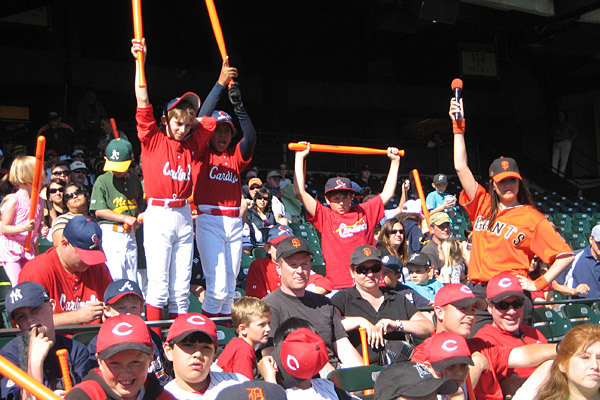 Youth baseball players use their giveaway bats to get Mike Krukow’s attention during the Q&A, as a member of the Orange and Black Attack holds the microphone. When I arrived at AT&T Park around 10 a.m. Sunday, the first-base side of the lower deck was already teeming with young fans, enjoying the Giants’ annual Youth Baseball Day. 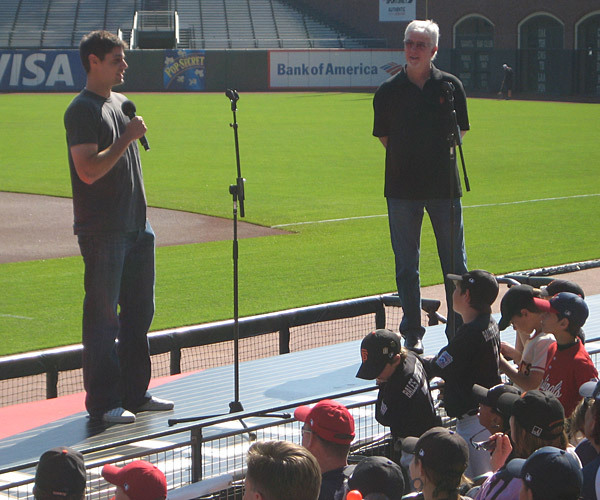 Hundreds of Little Leaguers, Pony Leaguers, Police Athletic Leaguers and more enjoyed a question-and-answer session, hosted by broadcaster and former Major Leaguer Mike Krukow and featuring bullpen coach Mark Gardner, pitchers Jeremy Affeldt and Joe Martinez and infielder Emmanuel Burriss. Martinez, still sporting the wicked black eye he suffered along with a concussion and three hairline skull fractures when hit by a line drive on April 9, gamely answered questions about whether it hurt to get hit and how many strikeouts he has this season. He said his most embarrassing moment in baseball was making it on SportsCenter for the first time but having it be for getting cracked in the head with the ball (hey Joe, nothing to be embarrassed about there — your doctor called you superhuman). 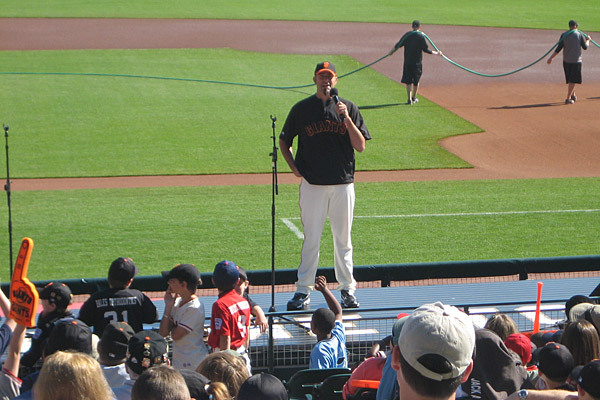 Martinez was asked to demonstrate his pitching motion, but Krukow quickly interjected and reminded the crowd that Martinez is restricted from any physical activity for at least another three or four weeks. After the Q&A, the kids got to participate in a pregame parade around the field before enjoying the game from their bleacher seats. The budding pitchers in the crowd got a great lesson from Randy Johnson, who no-hit the D-backs for six innings in earning his 296th career win. Tip No. 1, kids: Scowl. Speaking of Johnson, before the game, nine of the youth players took the field before the Giants’ starting lineup joined them to sign a ball. Steve Gilbert, our MLB.com D-backs reporter, told me that while with Arizona, Johnson never participated in such on-field events when he was starting (presumably because it would disturb his focus). However, the Big Unit jogged out, shook the hand of a young player wearing a Braves shirt, signed a ball, then shook the kid’s hand again before beginning his warmup throws. Clearly, his focus wasn’t affected — perhaps he should get that young player to show up before all his starts. Wednesday night’s game to wrap up the Giants’ series with the Padres is also Olympic Night at AT&T Park, something the Giants have done in recent years to honor the large number of Olympic athletes who call the Bay Area home. This year, they’ll be hosting the 40 torchbearers who had the honor of carrying the Olympic torch earlier in the day from McCovey Cove to Justin Herman Plaza in the torch’s only North American stop. Though the torch run is slated to end by 3:30, fans should note that protests related to the torch run could lead to residual traffic problems later in the day, so plan accordingly.